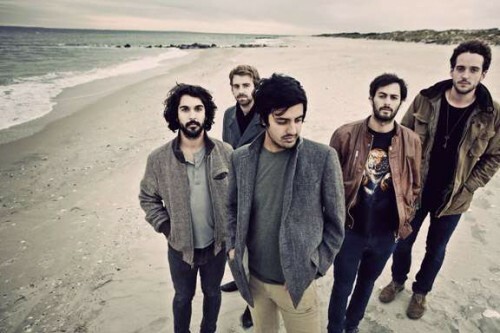 It’s March 2012, and Young the Giant have had a jam packed couple of years. Now they’re on a nearly sold out U.S. tour, bringing their “sun soaked” sound all the way down to the sunniest places of them all, Fort Lauderdale. Before their show at the Culture Room, we spoke to drummer, Francois Comtois about touring, the VMA’s, and what makes Young the Giant so soothing on the ear. Since your debut in 2010, things seemed to kickstart pretty quickly- With your single “My Body” peaking on the Billboard Charts, and your recent performance at the VMA’s, were you prepared for the public’s adoring reaction? Francois: Although most people have only fairly recently gotten to know our work, we definitely feel as though we spent a good deal of time paying our dues on the touring front. It now seems like those years spent feeling exhausted and, at times, frustrated, helped keep us grounded in the face of such a radical rise in recognition. Speaking of readiness, your live shows seem to be a big part of your appeal as a band. You’ve received a lot of attention for your shows, such as the aforementioned VMA’s, Lollapalooza, and iTunes sessions. Any pre-show rituals that contribute to your on-stage dynamic? Francois: People are usually surprised to see how mellow we are before we play. On any given night, our pre-show ritual consist of sitting around, drinking tea and a little whisky and trying to focus our energy on the task at hand. Then, as were getting ready to walk out on stage, its as if a switch flips inside of us and the adrenaline begins coursing through our veins. Kind of a silence before the storm scenario. Nowadays, the industry seems to be coming up with a whole new spectrum of whacky genre names to pinpoint up and coming bands. How would you describe your sound as a genre, without any preconceived notions from critics? How does it feel to be headlining such an anticipated excursion? Francois: There was a whole range of emotions leading into this run, ranging from elation to panic. On one hand, we most definitely felt some pressure to deliver on our first real headlining run. On the other, just the thought of playing our music to fans in some of the most amazing theaters/venues in the country made us giddy as schoolgirls. The music and lyrics on your record convey a strong sense of emotion and honesty. How would you say you go about the writing process? Do you focus on the lyrics first to guide the sound, or vice versa? Francois: Our songwriting process is deeply collaborative (every member of the band participates and has an equal voice) so, as a result; there is a tendency for the music to precede the lyrics in many of our songs. That being said, sometimes the vocal melody or lyrical content can help steer the arrangement in a different direction. The most important thing that weve learned in our experience is never to go into the studio with preconceptions about how things should turn out. Have you started thinking about your next album? If so, what do you think these last couple of years have given you that may contribute to a follow up record? Francois: I think it’s safe to say that weve been thinking about our second record since the day the first one dropped. Recently, we were able to take a few months to settle down in LA and get to writing. As sentient human beings, we draw a lot of our inspiration from the sights, sounds, encounters, etc. in life. Seeing as the last two years of our lives have been heavily dominated by touring, you can bet that good portion of the next record will draw from the unique situations weve been lucky enough to experience and the lessons weve learned together. Ticketmaster is not selling the tickets via the site :/ any advice?